September 8, 2016 – Nearly three years after the onslaught of Yolanda (international name: Haiyan), housing for more than 14,000 displaced families remains an issue. 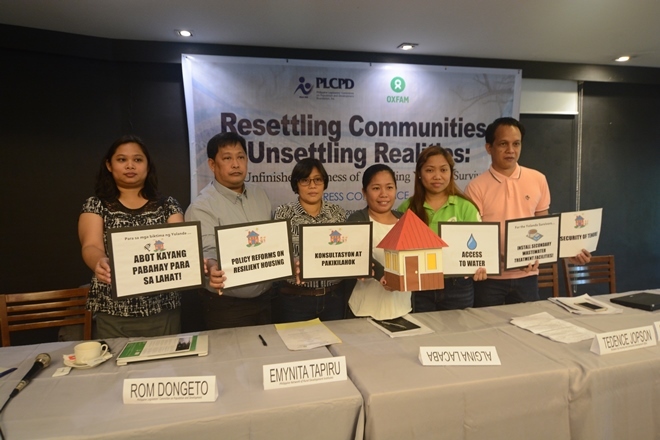 In a press conference held in Quezon City, typhoon survivors, local government officials, and advocates raised concerns on water access and sanitation in resettlement sites. Despite concerted efforts by the government, civil society and international organizations, significant challenges remain in the recovery and rehabilitation of the affected communities. In Tacloban City, some 14,433 families, comprising 40 percent of the total affected families, were targeted for relocation by the national and local governments in the northern barangays. As of date, only 13 percent of the internally displaced persons (IDPs) have relocated. Meanwhile, families who have already relocated have to grapple with major problems like scarcity of water, the lack of waste water treatment facilities, inadequate livelihood opportunities, and unclear information on tenurial security. “Until now, those of us who have resettled in Northern Tacloban still do not have access to potable water. The city government provides some through water trucks at two times a week. But this is not enough,” lamented Algina Lacaba, secretary of the Coalition of Yolanda Survivors Association of Tacloban (CYSAT). According to the city government of Tacloban, the problem of water scarcity has been there even before Yolanda. “For northern Tacloban, the problem is that there is no viable source of ground water in most of the areas. At the same time, the Leyte Metropolitan Water District (LMWD) has imposed a one-subdivision, one meter policy, which effectively deprives northern Tacloban of water supply,” said Community Affairs Officer IV Tedence Jopson. Philippine Network of Rural Development Institutes (PhilNet-RDI) Operations Manager Emynita Tapiru explained that the lack of water has resulted to problems of malnutrition and poverty, inability of children to go to school, and conflicts within families. She mentioned that, “Because of the lack of water, many families are forced to buy water elsewhere. This diminishes their capacity to buy food. Children’s opportunity to go to school is also reduced because they are asked by their parents to cue and fetch water when it is scheduled for water distribution. CYSAT and PhilNet-RDI are calling on the National Housing Authority (NHA) and its developers to improve the septic tanks for every household and to separate the storm drainage from the sewer lines. They are also recommending that secondary wastewater treatment facilities be installed and ensure that standard or stronger materials be used in the construction of houses. At the same time the LGU of Tacloban City is calling on the national government and Local Water Utilities Administration (LWUA) to facilitate the provision of water for the Yolanda Survivors. In particular, they are requesting for the immediate release of the remaining funds of the approved P527 million-budget to put up the water system in northern Tacloban. Lastly, they are proposing for the allocation of P116.6 million for the provision of a centralized sewage system for the entire city of Tacloban. “It is high time that a legislation be passed to provide a national framework on resilient human settlements and adequate housing in order to address these problems and harmonize all existing policies on housing and integrate standards for resilience,” PLCPD executive director Romeo Dongeto added.